Want to fly in luxury on a private jet for the price of travelling with a scheduled airline? Find out about our latest empty leg deals! Empty legs on our private flights occur when the jet has been chartered for a one-way journey. The empty leg is the pilots’ return flight back to base, or a flight to a destination that puts the jet in position for its next chartered assignment. The cabin would otherwise be empty on this leg of the journey, which means we can offer seats at a huge discount. Savings of around 70-75% are not uncommon for empty legs. For example, a standard full-price charter cost for a 4-seat Citation Mustang (very light jet) from Luton to Paris (or Paris to Luton) would cost approximately £3,500, whereas its empty leg might be offered at approximately £1,000. Empty leg deals are especially popular with clients who want the luxury of private jet charter and are also able to be flexible with their travel plans. Empty leg offers are often offered at short notice, and customers need to understand that the empty leg is dependent on the full-price leg running to schedule. Flexibility can sometimes be co-ordinated to get two separate empty leg deals for outbound and inbound journeys. Otherwise, one-way tickets with a scheduled airline can complement the private jet’s luxury empty leg journey. 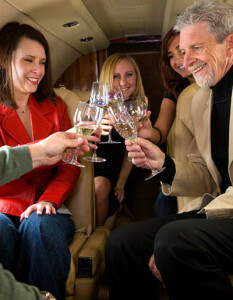 The pricing – as with all private jet charters – is for the whole plane. So, if the empty leg for the 4-seat Citation Mustang is offered at a price of £1000, the cost can be shared among 4 people paying £250 each. This is often comparable with or even cheaper than the cost of a regular scheduled flight ticket, especially at peak times, with the bonus of being able to travel in style without the crowds. Even transatlantic flights, which need a heavyjet such as a Gulfstream IV (seating 14), can be offered on an empty leg at a cost that potentially beats first class travel on a scheduled airline. For example, a typical full price cost for a private Gulfstream IV from London – New York would be £55k – £65k, while the empty leg for 14 people could be as low as £25k, working out at £1,785 per person.